(Voice of the Persecuted) Maryam Naghash-Zargaran – Nasim was arrested and put into prison for practicing her right to believe in the religion of her choice. In this case it is Christianity. She was sentenced to 4 years on July 15, 2013 in Iran’s notorious Evin prison. Maryam is in ill health, and has suffered a heart attack while in prison. Why is Maryam in prison? When she was arrested, Maryam was involved with the establishment of an orphanage in Iran. Despite having no political agenda, an Iranian Revolutionary Court falsely declared Maryam’s Christian activities to be proof that she was ‘acting against the security of the Iranian nation’. Her imprisonment violates international law, to which Iran is a party, which guarantees freedom of religion and belief. In September 2013, Maryam was transferred to Modares hospital on Sunday to be treated for her heart disease. Having had heart surgery before, mental pressures in prison resulted in her heart attack, and as a result she was transferred to hospital. To date, there is still no detailed news about her condition. Additionally, Maryam is suffering depression due to the effects of prison conditions. Her friends, are determined to ensure that Maryam is not forgotten. Please continue to send postcards to Maryam at Evin Prison. Your words and letters to Maryam will not be wasted if you write. The postcards and letters you write will make a big difference to Maryam, letting her know that she has not been forgotten. Feel free to use scripture, but please do not write negative comments about the Iranian government. Messages will be read by the prison guards. 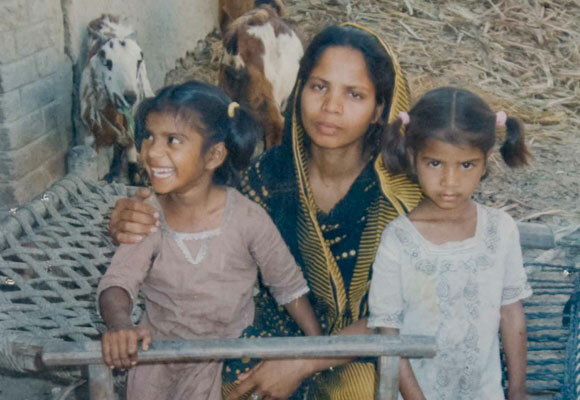 Asia Bibi, is a Pakistani Christian woman who was convicted of blasphemy by a Pakistani court, receiving a sentence of death by hanging. In June 2009, she was involved in an argument with a group of Muslim women with whom she had been harvesting berries after the other women became angry at her for drinking the same water as them. 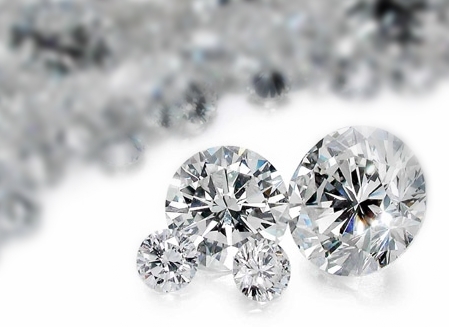 The woman considered the well defiled after Bibi drank from it because she was a Christian. She was subsequently accused of insulting the Islamic prophet Muhammad, a charge she denies, and was arrested and imprisoned. In November 2010, a Sheikhupura judge sentenced her to death. If executed, Bibi would be the first woman in Pakistan to be lawfully killed for blasphemy. The verdict, which was reached in a district court and would need to be upheld by a superior court, has received worldwide attention. Multiple petitions have called for the charges against her to be dismissed. She received less sympathy from her neighbors and Islamic religious leaders in the country, some of whom adamantly called for her to be executed. Christian minorities minister Shahbaz Bhatti and Pakistani government politician Salmaan Taseer were both killed for advocating on her behalf and opposing the often misused blasphemy laws. Asia’s family has gone into hiding due to receiving death threats and has voiced concerns that she could be killed by extremists if released from prison. 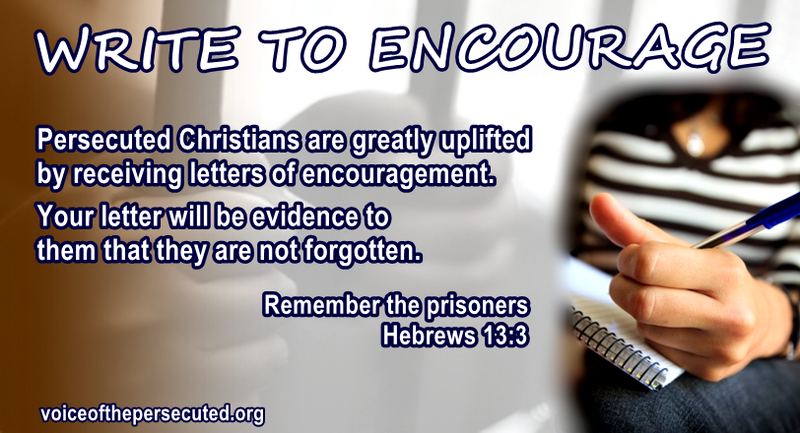 Show your support for this Christian sister by writing a letter to give her encouragement to endure. And please remember to keep Asia and her family in your prayers. Letters will be screened by Voice of the Persecuted advocates for Asia’s protection. Pastor Saeed and his wife, Naghmeh Abedini have been facing insurmountable spiritual warfare because of their Love for God. 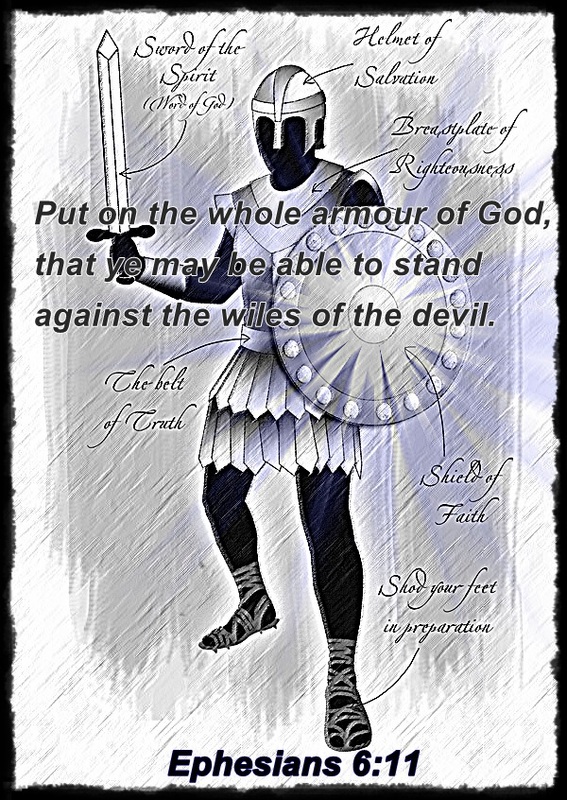 I hope and pray that myself and each one of us can stand in the face of evil and proclaim that Jesus Christ is Lord! We must press in and rely on God for all thing in our lives—trusting in Him with no limits. Focusing our attention solely on Him. We must also pray for the lost to be found in Christ. May we boldly go forth sharing the Gospel of love and truth and may they accept it with open minds and hearts. May we being living sacrifices so that our faith, love and testimonies point them to the Lord. May all the glory and praise go to our Father in Heaven. IN FAITH, KEEP PRAYING AND TRUSTING. Thank you for stepping out of the ‘comfort zone’ to support the persecuted. God bless you, sister! My name is Evelyn, I am 11 years old. My family and I pray for you every day. We pray for your wife and children too. Sometimes I think how it would feel for my dad to be in prison, I would feel very sad. This time is a time for you and your family to trust in the Lord Jesus, and for me to trust that the Lord will deliver you from this time by setting you free or taking you to be with him in his perfect heaven. 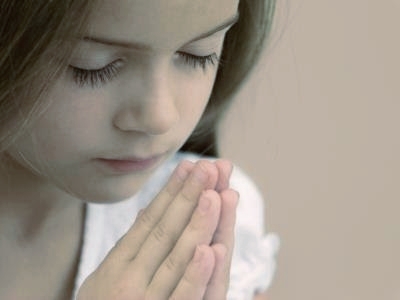 I will keep praying for you and your family. I can’t wait to see you in heaven!!!!!!!!! Thank you, Evelyn for sharing your prayers and letting the Abedini’s know that you care for them. Trusting in God can be very hard for us. But HE knows the end from the beginning and goes with us through the storm. Though in our human ability it may be hard to understand, God must have a very good reason for allowing Pastor Saeed to remain in prison. God knows Saeed will be faithful to share the Gospel and the love of Christ with prisoners who don’t know Jesus. HE is making a way for them to be found in Christ; not wanting any to perish. Hallelujah! Together, we will keep praying for Pastor Saeed to be released and reunited with his family very soon. 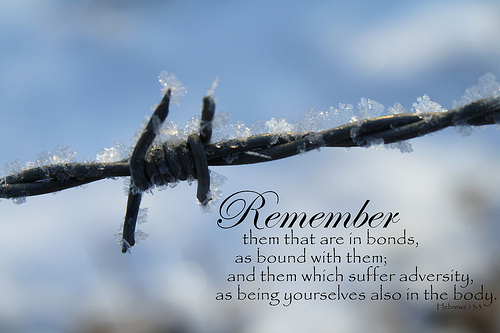 We must remember that our Father in Heaven loves us very much. And that HE is a sovereign God in control of all things—even in a prison cell. To the glory of God, keep trusting in the Lord with all your heart and He will guide your path wherever He takes you. 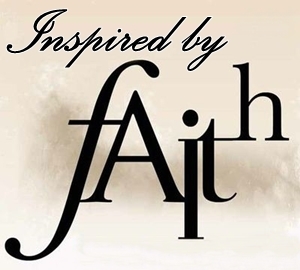 Join in this project to let the Abedini’s know how they have inspired or renewed your faith. Each testimony will be a source of encouragement to them and the Body of Christ. When the family is reunited, we will gather the stories to be published in a book and presented to them as an appreciation for their steadfast faith. Together, we will be able to provide a little insight into how God has worked through them to be a blessing to more than they realize. Add your testimony below. If your church has been active in praying for this persecuted family, inform them of this special mission so they too can share their thoughts and be an encouragement. Several years ago I was in Africa in a little country where an enemy had taken over the government. There was great oppression against the Christians by the new government. The first night I was there some of the native Christians were commanded to come to the police station to be registered. When they arrived they were arrested and during the night they were secretly executed. The next day the same thing happened with other Christians. The third day it was the same. By that time the entire district realized that the Christians were being systematically murdered. It was the intent of the new government to eradicate them all – men, women, and children – much as Hitler tried to eradicate all the Jews. I looked out on that congregation of black and white faces. The room was hot and stuffy. Moths and other insects came through the screenlesswindows and swirled around the naked light bulbs hanging over the bare, wooden benches upon which the natives sat. They were all looking at me, expecting, hoping, that I could bring them a word from God for this tragic hour. I looked out at my African friends. Many of them had already lost loved ones to the firing squad or the headsman’s axe. I knew that others would surely die that week. They were listening intently. My African friends were nodding seriously. They, too, believed God would supply all their needs, even the power to face death bravely. “Tell us more, Tante Corrie,” one grizzled old man said. It was as though they were storing up all the truth they could so they could draw on it in the day of trial. I told them of an incident that had taken place in the concentration camp at Ravensburck. “A group of my fellow prisoners had approached me, asking me to tell them some Bible stories. In the concentration camp the guards called the Bible “das Lugenbuch” – the book of lies. Cruel death punishment had been promised for any prisoner who was found possessing a Bible or talking about the Lord. However, I went to my little cot, found my Bible, and returned to the group of prisoners. “I could see the worried, anxious looks on the faces of the prisoners. Before it had been only me speaking. Now they, too, were going to have to use their mouths to sing. But I felt God wanted us to be bold, even in the face of the enemy. So – we sang. The faces before me broke into broad grins. Gone were the wrinkles of fear and anxiety. Once again their eyes were flashing with joy and their hearts were filled with peace. I closed the service by reading a poem of Amy Carmichael. Should we not have scars? Show us Thy hands and feet. The meeting was over and the Africans stood to leave. Then softly, in the back of the room, someone began singing an old gospel song. 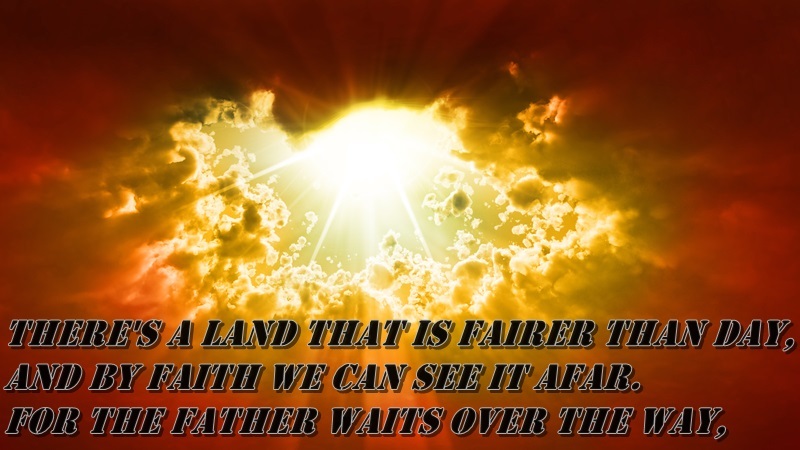 And by faith we can see it afar. I don’t know how many were killed that week, but someone told me that more than half those who had attended the service met a martyr’s death – and thus received a martyr’s crown. But I know that God’s Spirit of glory had been resting upon them. 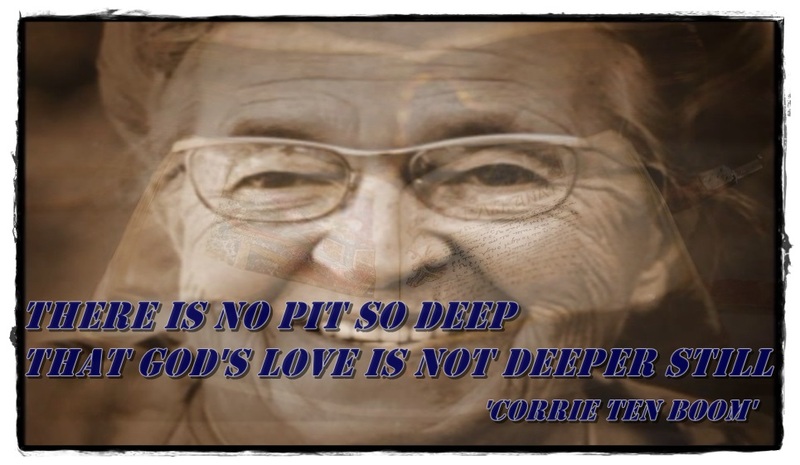 Excerpt from Corrie Ten Boom’s book: Tramp For The Lord. Also read of Corrie Ten Boom’s experiences in a Nazi concentration camp in The Hiding Place. Please follow all instructions when writing letters and remember to be respectful. We would never want to bring more harm to our suffering brethren. American Pastor Brunson continue to need our encouragement and prayers. Thank you for writing, but we are asking that letters not be sent at this time. It appears they may be preventing letters from his wife from getting through. His wife has shared that he despairs of ever getting out, of being reunited with her, hugging his children, attending important family ‘life events’, etc. There are long delays for his wife’s visits to be approved. Andrew has not been allowed books so day after day is empty and long. 20 people are crowded in the room, with almost no space to walk. His cell mates are extremely devout Muslim men- prayers constantly going on. They would like to convert Andrew. Andrew’s spiritual encouragement – for him to hear from the Lord. That his wife will be granted regular visits with him. That he will be allowed books as permitted. Please continue to pray for his release.